The ITSG-Grace2016 gravity field model is the latest GRACE only gravity field model computed in Graz, providing unconstrained monthly and Kalman smoothed daily solutions. It covers the whole GRACE time span from 2002-04 and will be continually updated. For each month of the observation period sets of spherical harmonic coefficients for different maximum degrees (60, 90, 120) were estimated without applying any regularization. Daily variations are co-estimated and eliminated from the normal equations. For most applications a spectral resolution of degree 60 is sufficient. In some cases a higher resolution is preferable but in some rare months the orbit configuration doesn't allow to solve for high degrees (e.g. 2004-09). In order to recover fast gravity field variations as detailed as possible, it is reasonable to increase the temporal resolution. The goal is the calculation of daily GRACE solutions. This increase in temporal resolution results in less observations per time span and therefore a reduced redundancy in the parameter estimation process. This leads to a decreasing accuracy of the estimated parameters with decreasing time span. It can be assumed, however, that the gravity field does not change arbitrarily from one time step to the next. The information about the temporal correlation patterns can be derived from geophysical models. Utilizing this knowledge, the temporal resolution can be enhanced without losing spatial information within the framework of a Kalman smoother estimation procedure (Kurtenbach et al. 2012). 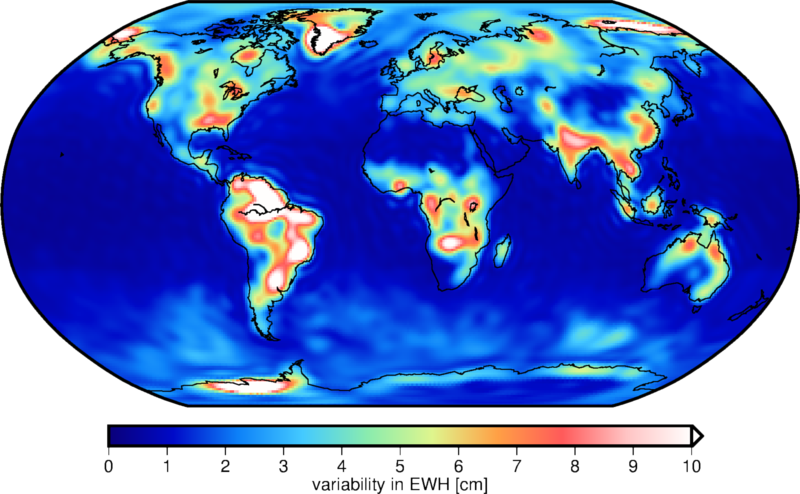 The following geophysical models were used to derive the temporal correlations: the WaterGAP global hydrology model (WGHM), the atmospheric model ECMWF, and the ocean circulation model OMCT. In order to guarantee that the GRACE solutions are not biased towards the model values themselves but that only the stochastic behavior is exploited, the model output of the years 1976 - 2000 (i.e. outside the GRACE time span) was applied. For each day of the observation period a set of spherical harmonic coefficients for degrees n=2...40 was estimated. The Kalman smoother delivers daily solutions, even if there are no GRACE data available for a specific day. These days should be handled with care, as they are predictions only and tends towards the mean trend, and annual signal of GOCO05s. Total water storage anomaly in the Mississippi basin compared with discharge during the 2011 Great Mississippi flood. Variability of the daily solutions (trend and annual variations removed) expressed as equivalent water height. The ITSG-Grace2016 gravity field solutions are computed using variational equations with an arc length of 24 hours. In addition to satellite state and instrument calibration parameters, daily gravity field variations up to degree and order 40 were modeled in the adjustment process. K-band range rates with a sampling of 5 seconds and kinematic orbits with a sampling of 5 minutes were used as observations. The kinematic orbits of the GRACE satellites (Zehentner and Mayer-Gürr 2013, 2014) were processed using the GPS orbits and clock solutions provided by IGS. An improved attitude product derived from a combination of star camera data and angular accelerations (Klinger and Mayer-Gürr 2014) was used to estimate K-band antenna center variations (One set per month). Additionally, accelerometer scale factors were estimated per axis and day. The accelerometer bias was modelled through cubic splines with a node interval of six hours and estimated for each axis and day. The above models were reduced during the analysis process. They are not present in the solutions. The AOD1B product is provided (separately for ocean and atmosphere) as mean value over the specific time spans (daily, monthly) in the download section.